No, we did not take the suggestion. Rather than jury-rig coverings over Rutherford Custom Homes’ damaging building practices with awnings, other coverings, or a huge tent over our home to keep rainwater out, we rebuilt it. Of course, we had to have tons of stone removed, then stone walls rebuilt to do much of this. I believe we can take some credit for helping one vendor get paid thousands of dollars, more than a year after we paid the Rutherford Custom Homes in full for his materials. I’m sure I’ve missed some things, but when you look at what we rebuilt, roof, walls, windows, doors, floors, plumbing, paint, who would have thought so much damage could be done by a homebuilder? 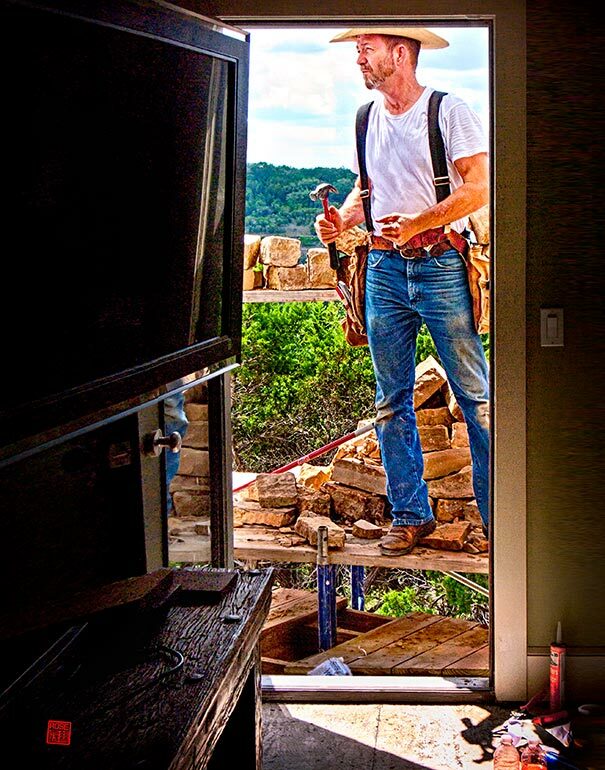 Yes, building a Texas Hill Country home with our Wimberley homebuilder has been quite an experience. While Beau Rutherford goes on building with other companies, we feel our home building days are over and we’re finally getting to things we wanted to do in retirement, after a 3 1/2-year reconstruction detour. Many tradesmen told us this wall was incorrectly done; one of our final deconstruction projects. Unevenly framed walls had to be rebuilt. 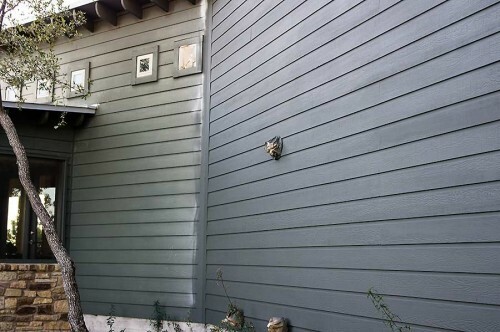 Rebuilt wall gets first of 2 coats of Duration, the contract paint, same color as the builder's thin, bottom-of-the-line switch paint, left. Tons of stone removed, revealing bag covering a Tyvek hole, and an unsealed door. Here, door is weather sealed. Removed stone reveals no weather sealing around office windows. 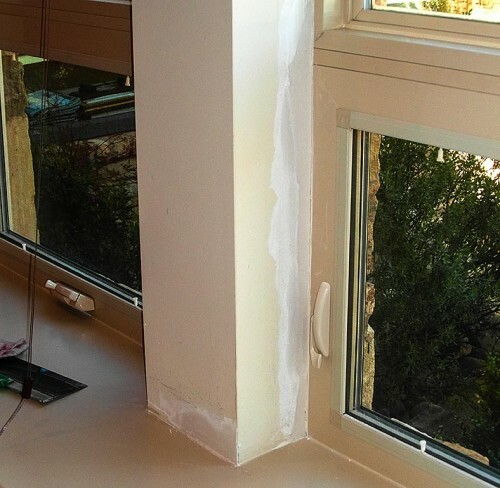 Peel and stick fixes window leaks, 18 months after architect and owners asked builders to weather seal them. Windows sealed after builder did nothing when water stains inside were pointed out. 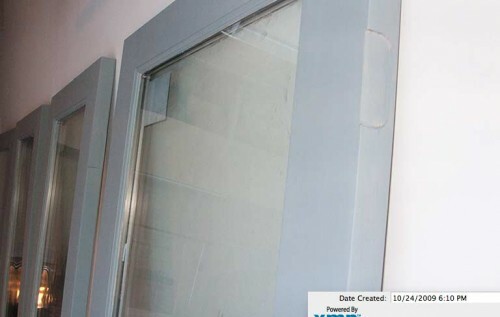 We had dry wall around leaking windows repaired then walls were repainted. Our painters refinish interior wood as original latex was wrong paint, too thinly applied, store manager said. Finishing what Rutherford CH painters left undone, not returning in July, 2009. 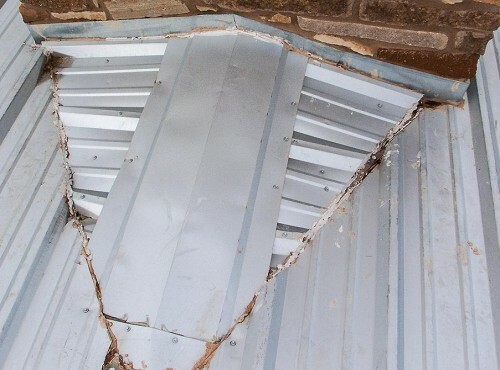 With so much wrong, we could not find a roofing contractor willing to repair the roof. We won't put our name on that roof, they said. New roof stopped observable and moisture-metered leaks. Plus, burn-out of in-ceiling lights went from 1 a week to less than 1 a year. 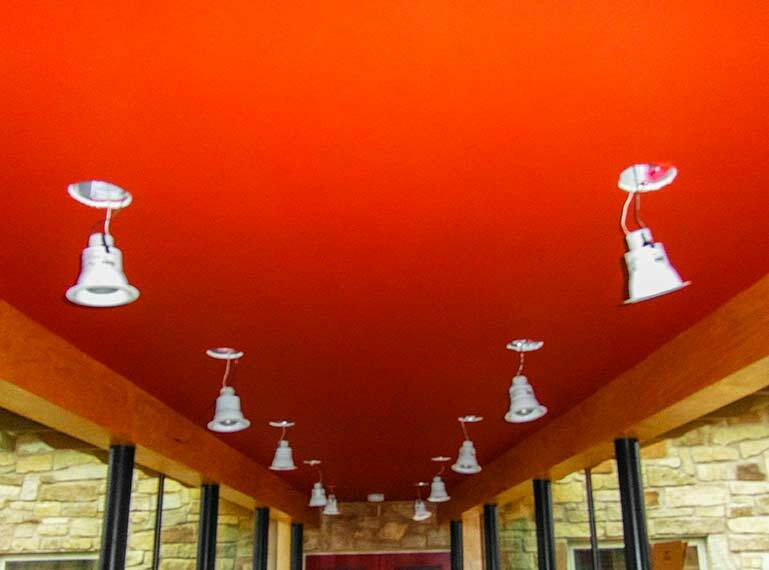 Foyer ceiling repainted after replacing heavily leaking roof that created frequent light outages. New doors primed, including mortices, tops. 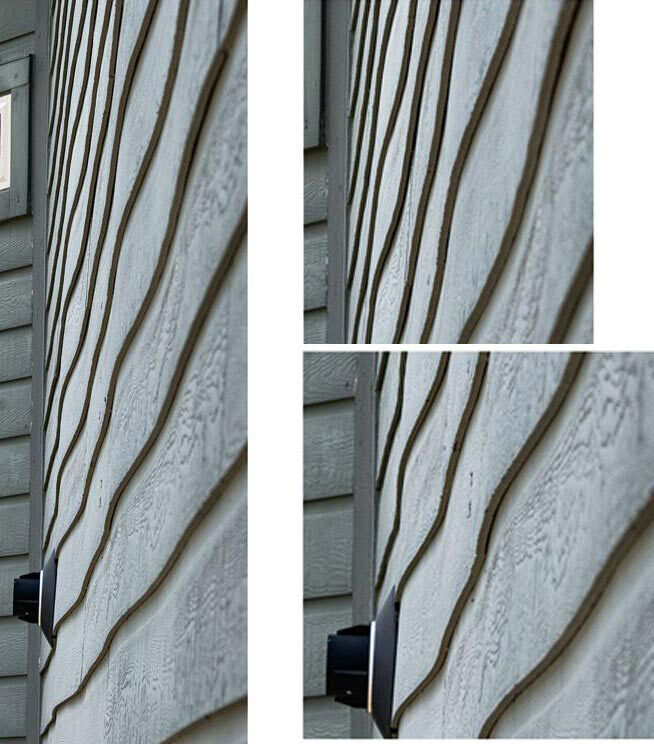 Rutherford Custom Homes did not even paint tops, mortice areas. 3 vents, moisture barrier wall added to humid crawl space. Builder rejected both. 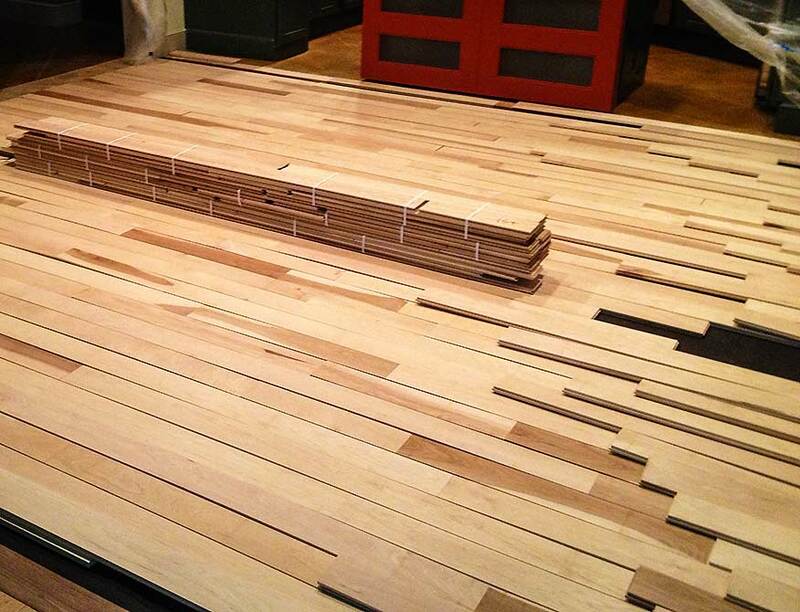 New hickory/pecan flooring arrives to replace the warped and cupped moisture-damaged originals. Plumbing throughout had to be upgraded to new, unbroken parts of compatible metals. 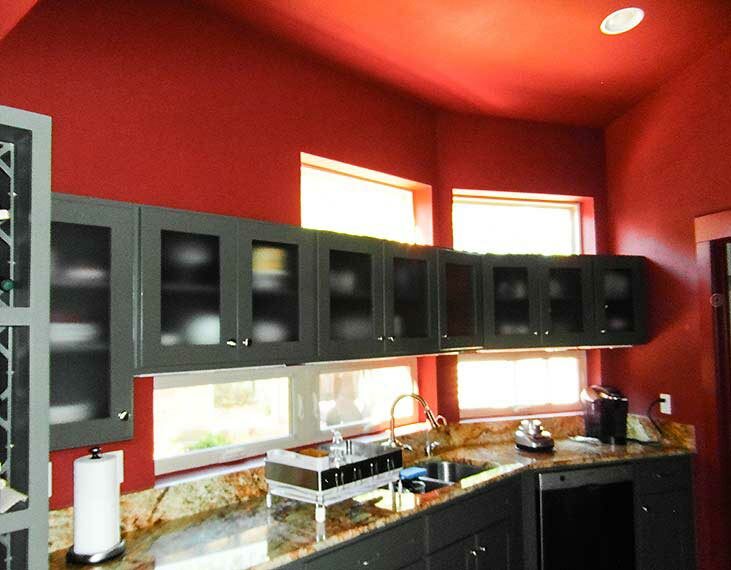 We added cabinet glass, per architect's plan and our order, replacing Rutherford Custom Homes' plastic. Our 5th Christmas was the first in our deconstructed, then reconstructed home. We hope the Rutherford Custom Homes nightmare is behind us. 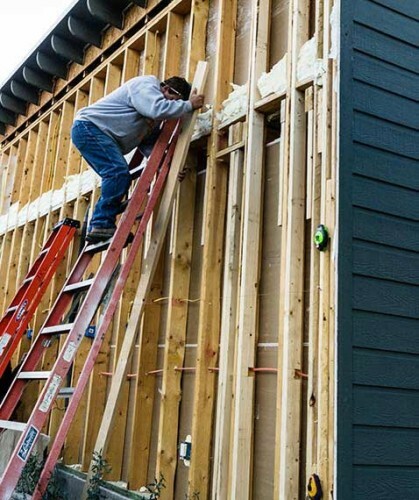 David Giles, Crossbow Construction, Inc., owner, rebuilds the flood-causing balcony. Kelly Robinson at the metal and wood interior stair railing he built. Kelly Robinson built the metal and cedar pergola, fence and entry gate. 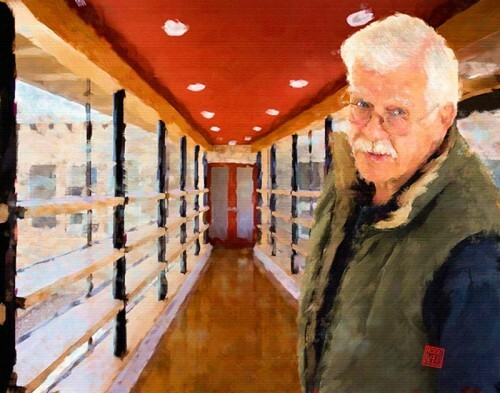 Eric Eskelund created the foyer shelves, as well as other carpentry. 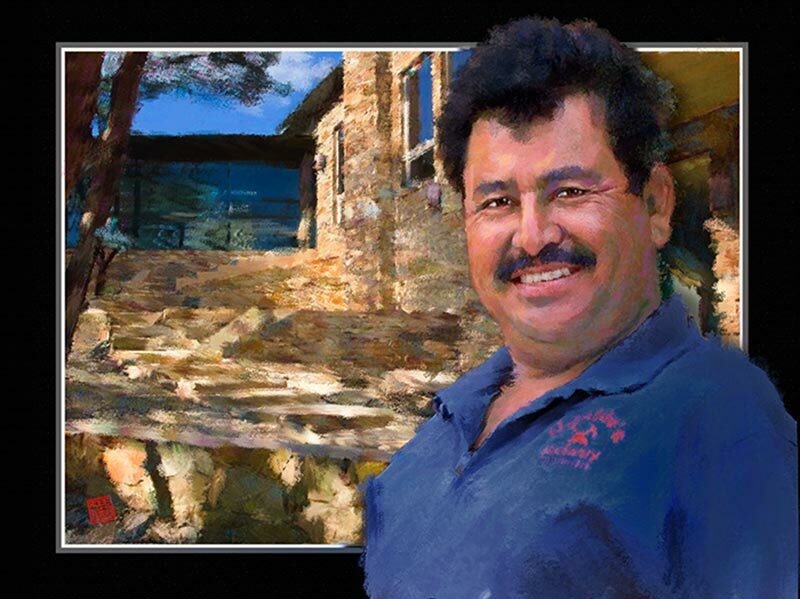 Gabriel Ugalde, owner of Ugalde's Masonry, did the stonework for the home's walls -- twice. 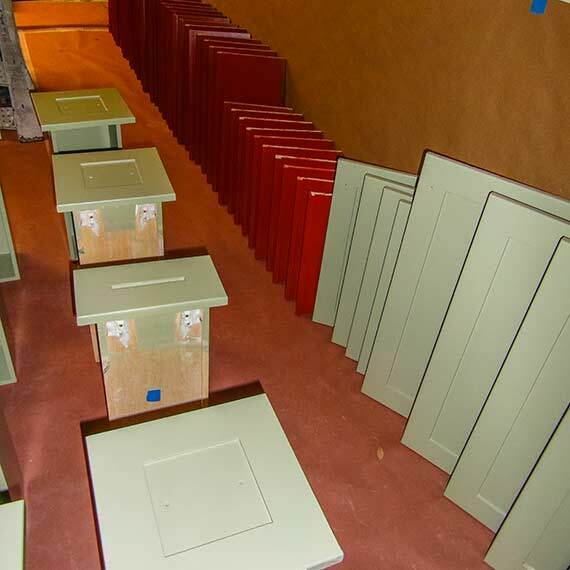 Our painters prepare to redo woodwork -- cabinets, bookcases, drawers. Painters refinished water-damaged drywall at windows throughout. 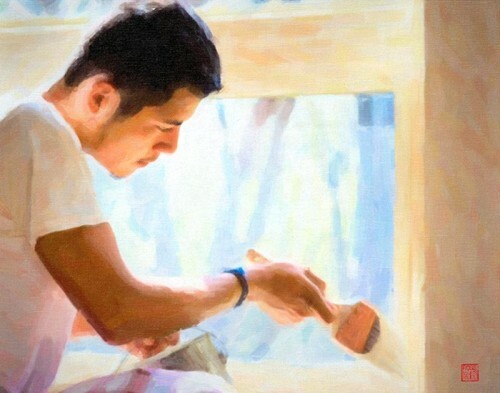 Juan paints around a living room window. Refinishing the water-damaged drywall around studio windows. 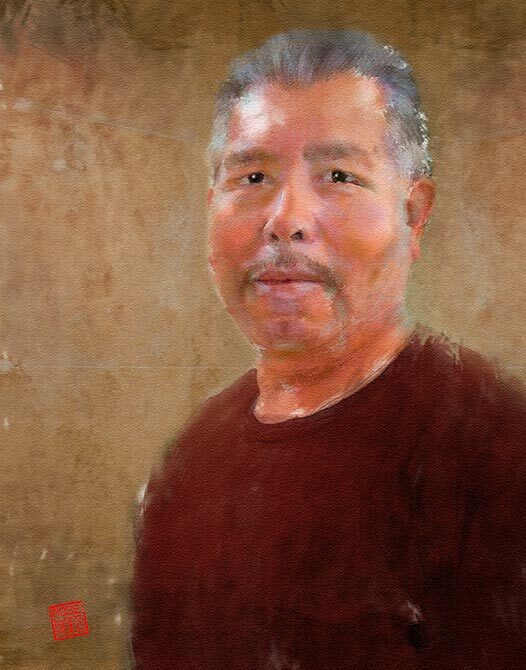 Daniel Mendoza, Superior Painting owner, refinished the woodwork, some ceilings and walls, and replacement doors. Esteban Lopez, owner of Esteban Lopez Masonry, fixes one of the builder's concrete errors with stone. Chon Esquivel did all the travertine work as well as freehand shaping. Cory Hanneman, Element 7 Concrete owner, did superior work, but called Rutherford Custom Homes on tardy pay, was terminated. Firm's old name was Texas Etch & Score. David Giles, owner of Crossbow Construction, Inc. in Bertram, was both a lifesaver and our home saver. He was the first contractor to deconstruct our mis-built home, which gave us an indication of the Rutherford Custom Homes’ destructive building practices. David found no weather-sealing material around our leaking windows. Then later, with a wall of stone removed, discovered the balcony was feeding water into the home rather than outside the walls. The balcony David built has not one warped board or loose screw, almost three years later. A thoughtful, dedicated craftsman who takes pride in his work, David helped us in many ways. Thank you Crossbow Construction. Rick Hager, owner of Liberty Windows & Door, of Liberty Hill, quickly found our water leak problems and got us help, fast. 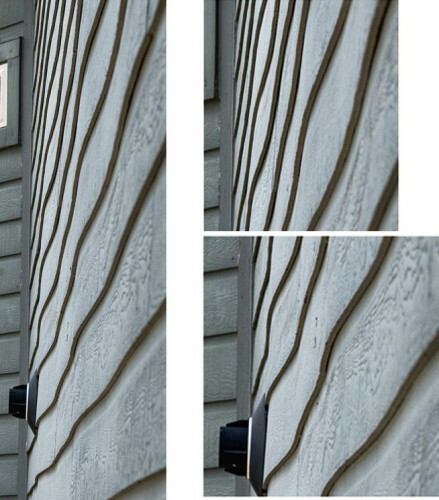 Rick discovered wide openings around window framing, as much as 1/2-inch. His recommendations of windows contractors led to our weather-sealing the windows, recutting the trim, and stopping the leaks. 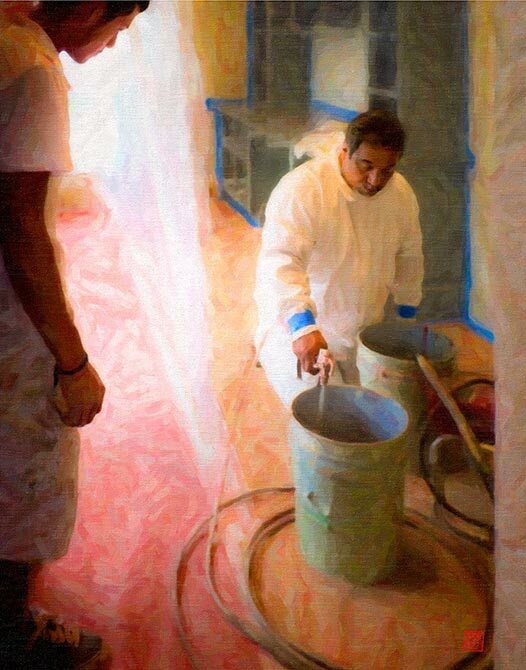 Rick’s revelation was our first step in deconstructing the home and finding what the builders had done to us and our home. Boatright Floors, Austin, identified many water-intrusion areas our builder left in our new home and helped us act quickly to stem the damage. After we discovered our hickory/pecan floor was warping and cupping, and the builder took little action to find the cause of the problem, we called the flooring supplier, Boatright. Greg Goodin came out with two moisture meters and found widespread damage and problem areas — well beyond where we thought the problem to be. Greg’s advice, with support of Sam Boatright, helped us quickly contend with problems from above (roof), sides (walls, doors, windows), and below (under-vented crawl space and grade-and-fill issues). Thank you Boatright Floors. 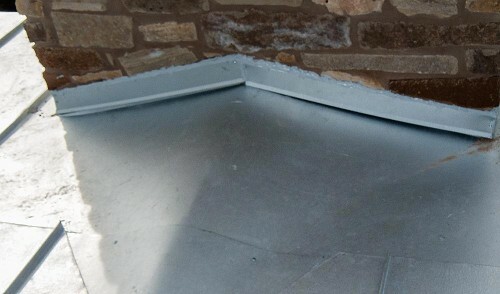 Mike Garcia, contractor, San Antonio, fixed the builder’s damaging crawl space below our wood floors and also replaced an incorrectly built wall. Mike, and also a supervisor with KM Builders, was recommended by Cleaning and Reconstruction Specialists of San Antonio. They also metered the house and measured widespread moisture intrusion. Mike quickly corrected the under-vented, super-humid crawl space. To add vents, he recommended Holes of San Antonio, and Mike took care of the rest of the builder’s crawl space issues. 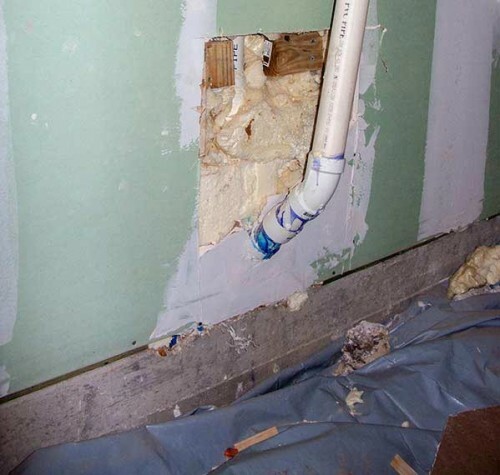 Plus, he replaced the builder’s leaking, non-moisture-barrier drywall from the crawl space to the house, with a moisture barrier wall. When Mike was finished, we were surprised how quickly the space became rehabilitated. Holes of San Antonio was prompt, efficient, and a godsend. They easily drilled three vents through our solid concrete crawl space wall, including through the stone wall outside. After our many crawl space moldy-smell complaints and To Do list items, Jim Rutherford said it was not possible to add vents to the crawl space beyond Rutherford Custom Homes’ one tiny vent. The Holes driller made doing just that look easy. Thank you Holes of San Antonio. 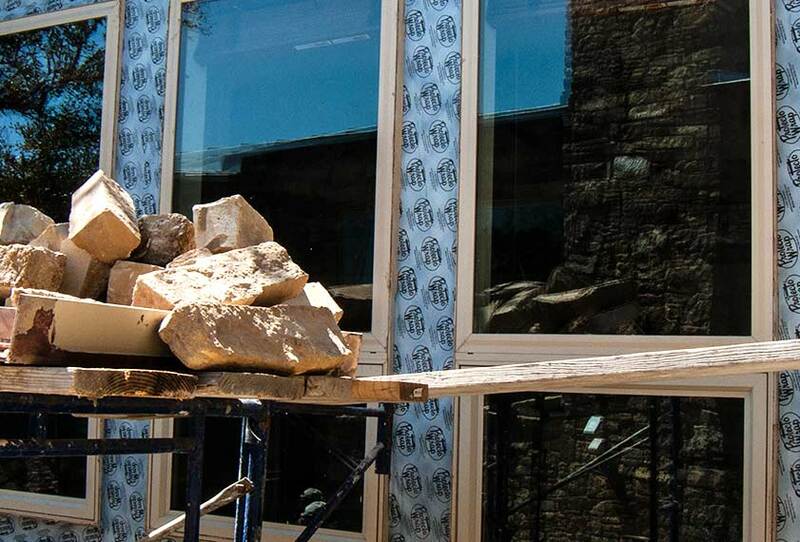 Ugalde’s Masonry of San Marcos did heavy work quickly, removing/rebuilding stone walls to allow repair of improperly built, leaking windows and doors. Owner Gabriel Ugalde’s crew did all the stone walls, as well as help us and Maldonados Landscape & Irrigation control the runoff problem. As we had to deconstruct the walls to fix the unflashed windows and improperly flashed balcony, much of the stonework had to be done twice. We also thank Gabriel Ugalde for pointing out that the foyer roof was improperly directing water to the home’s walls. That started our roof investigation and exposed multiple problems with our Rutherford Custom Home. Advantage Seamless Gutters, New Braunfels. Chester Arguello, owner, did more than fix our gutters, he told us of a bigger problem, a bad roof. Thanks, Chester, for working into the night to fix our gutters. We called Advantage after it was pointed out that rain was being directed to our stone walls rather than off the roof. Turns out the gutters were not installed according to the architect’s detailed plan, plus they had tiny egress holes that could not match the water flow. When Chester came down from the ladder, he said he had fixed the gutters: But the gutters aren’t your problem, he said, “your problem is your roof.” There are hundreds of rusted staples coming out and lying all over your roof, he said. That is what led to our immediate search for a roofer. Thank you Advantage Seamless Gutters. Varni Roofing, New Braunfels. They threw off our sieve of a roof and replaced it with such a good one, 3 neighbors ordered new roofs from Varni. Chris Varni, owner, Mike Worthey, rep. Mike was the second roofer to inspect our roof after we terminated Rutherford Custom Homes. He said it was the worst roof he’d seen in his 18 years experience, at the time, with multiple problems. As he ticked off the problems, I never knew a roof could have so many. As no one would repair our roof, they wouldn’t put their name on it, we selected Varni to replace it. The first rain brought a surprise. From inside the porch, we saw water run off the roof away from the house for the first time. I don’t know why we didn’t realize the runoff had all the time been directed to the walls. Varni did such a good job with our roof, three neighbors also had them build new roofs. Thank you Varni Roofing. 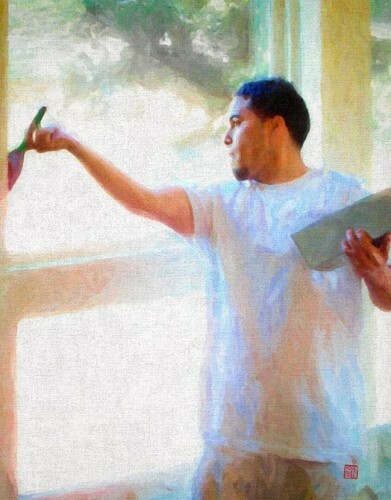 Superior Painting & Drywall, San Marcos. Superior owner Daniel Mendoza was among the first to point out some of our home’s problems. His good work and suggestions helped us through multiple paint issues. Danny was recommended by the Rutherford Custom Homes’ paint store manager when we asked for a good painter to look at our many paint problems throughout the house. He found the same problems as two paint store managers, plus, he said that it appeared our deteriorating doors were painted while weathered. Based on that comment, we began looking at the photos we’d taken with each visit during construction. The digital exif date helped form a timeline and revealed many of the problems with our Rutherford Custom Home. 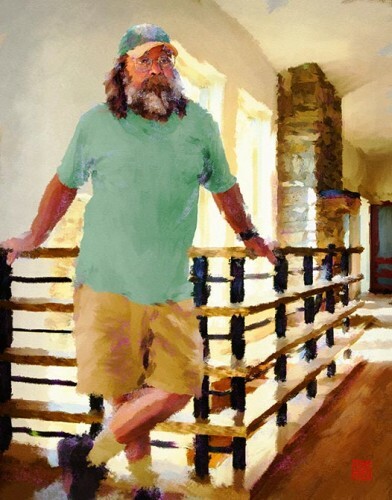 J.R. Smith, owner of JR Glass and Mirror, Spicewood, was excellent. 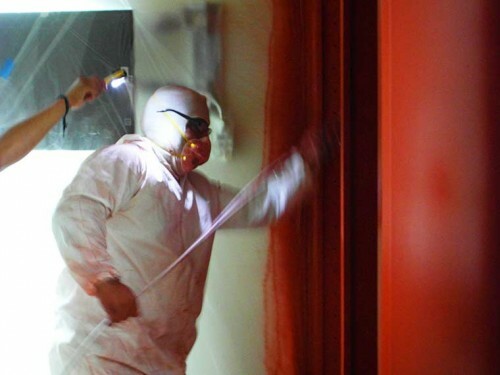 He helped beyond glass, pointing out a wall opening others missed, stopping a leak. JR sold the builder glass for showers in all bathrooms as well as our long, floor-to-ceiling glass foyer. Despite the architect’s drawing, when J.R. saw flashing was not going to be used in the foyer, he created the flashing himself, likely saving us from massive foyer leaks. On a later visit, although not his area, he pointed out a 3-foot-long gap in the Hardiplank. That had been a rainwater entry point no one else had found for three years. It sealed another leak. We’re glad we used J.R., a man who takes pride in his work. Thank you JR Glass and Mirror. 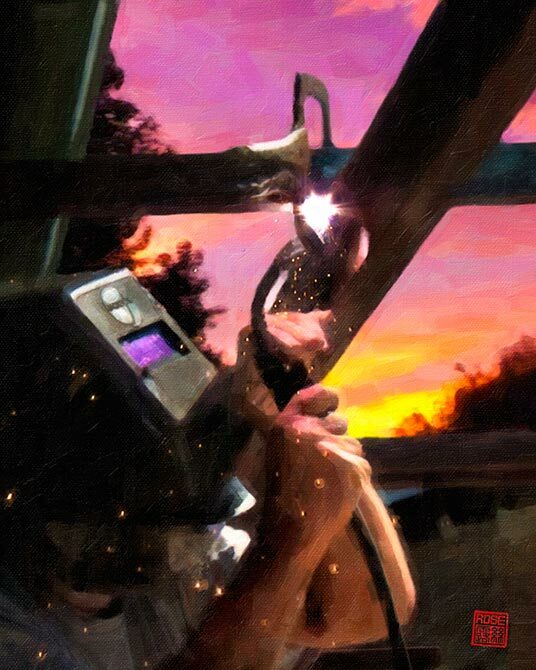 Kelly Robinson, ironworker, Wimberley has a great work ethic. Kelly did the ironwork for our stair structure, patio rails, and balcony. Then after move-in, we had him execute the architect’s plan for the pergola, gate and fence that weren’t build with the house. Kelly is exacting, great at finding the right materials, and was creative in redoing the builder’s botched work, as well as finding ways to make sure things are substantial. 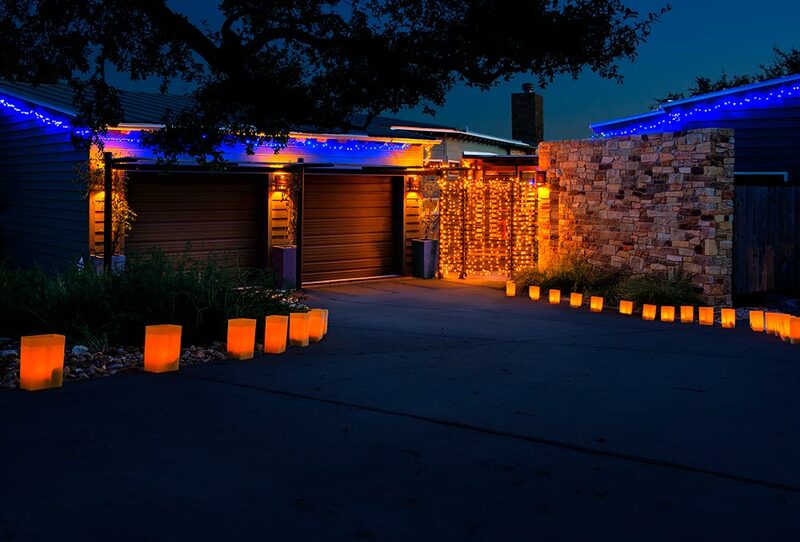 Maldonados Landscape & Irrigation of New Braunfels greatly helped us control the rain damages from Rutherford Custom Homes’ not following the architectural plan and then not following grade and fill recommendations to compensate. We had no plans to landscape, wanting the site natural, but the runoff forced us to act quickly after rain washed out the septic field. Clinton McGee, septic installer, honest and dedicated, he substantiated our septic service rep’s assessment of a stone wall over the septic clean-out tank, making it was unserviceable. A month after moving in and hearing from the rep that our system could not be serviced, I called Jim Rutherford. He said the rep was wrong, that the buried tanks were in the other direction. Next visit, the service rep asked why the wall was still atop the tank. I told him what Jim Rutherford said, and that I’d also given the information to Beau Rutherford, including on a To Do list, and that Beau had done nothing, thus there likely wasn’t a problem. The rep checked the tank and indicated the Rutherfords were wrong. It took awhile to track down Clinton McGee, but he immediately confirmed that the wall was over the tank and said he told both Beau and Jim Rutherford so. He said they told him to leave it. When I told McGee the Rutherfords had not removed the wall over the tank, and we had terminated them for many reasons, he sent Henry Chesnut. Chesnut took down the wall, found the tank where the service rep and McGee said it was, and extended the tank top so the septic system could be serviced. Wimberley Plumbing, Wimberley. We were fortunate to have found excellent Wimberley Plumbing. Because of our bad builder, they helped us often. They replaced leaking broken and cracked parts in our new home, improper metals that were eating away our pipes, and half-century-old plumbing practices. Those practices required us to hire a carpenter to cut open walls to get to leaking connections. Thank you Wimberley Plumbing. 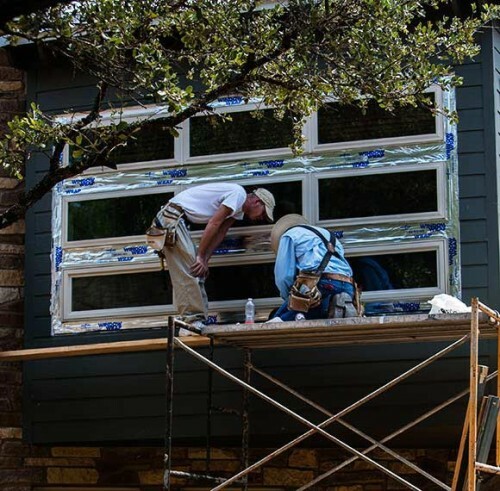 Campbell Construction, Keith Campbell, owner, Wimberley. Keith came to our rescue a few times when needed, cutting open walls for the plumbers. He instructed us how to apply heat and air to dry out the insides before he came back to rebuild the walls. We spent too many days and nights moving fans and heaters outside the house to dry out those walls. Esteban Lopez Masonry, Wimberley. Esteban helped in a number of ways. 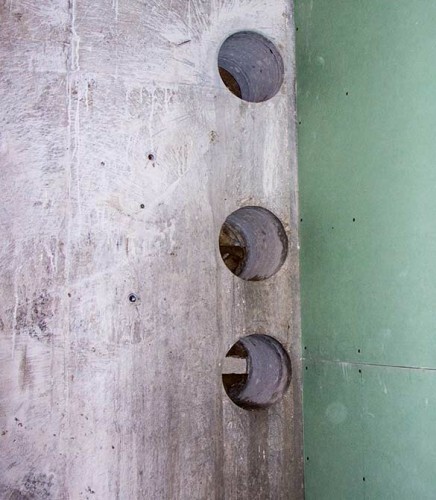 Mainly, he cut both ends of the foyer concrete where the plans called for control joints. My opinion is that no one at Rutherford Custom Homes knew how to execute control joints and didn’t understand their use, thus they omitted them in the concrete pour. The result was cracks, cracks known to come at each end of the foyer. But unlike the planned and controlled cracks in the architect’s plan, we got Rutherford Custom Homes’ uncontrolled and unsightly cracks. Esteban eliminated the unsightly cracks by embedding stone into each end of the foyer. He also added other interior stonework. 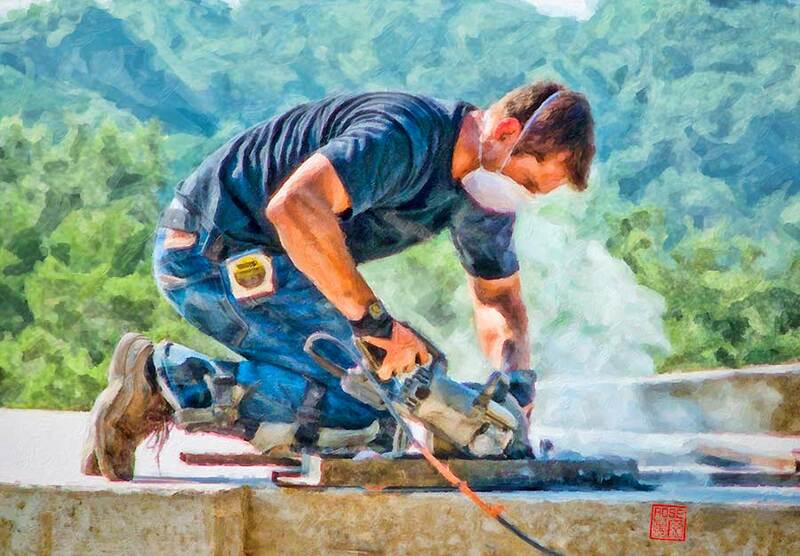 RKL Construction, Spring Branch. Robert Lindsey, owner, and his crews were versatile and efficient in fixing numerous builder problems in our new home. 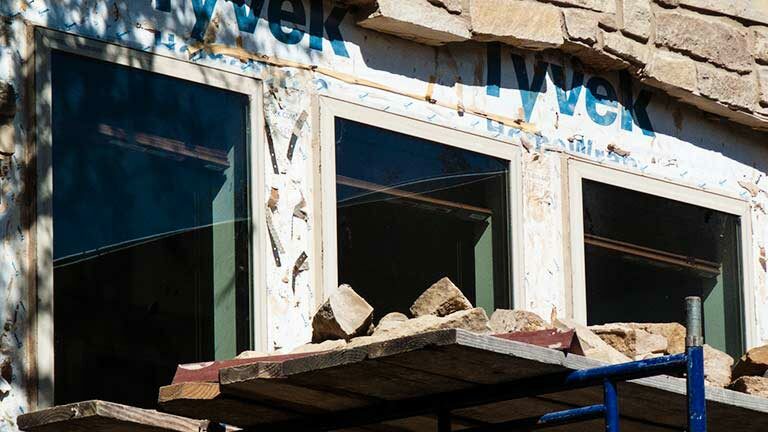 RKL did plenty of work in deconstructing then reconstructing the house the right way. He was often amazed that things could have passed City of Wimberley inspection. Just to mention a couple, he tore open the kitchen wall to properly connect the stove vent hood to a roof exit pipe in a straight line with smooth pipe. The builder missed connecting the two pipes and had used a flexible duct that was doubled over, shutting off airflow, and had crevices that could trap grease and catch fire. 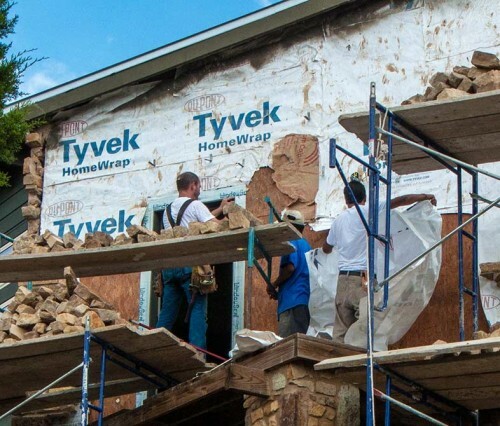 His crew also opened two crooked walls, installed new framing to unbow the walls, then inserted insulation the builder said was there, but wasn’t. It was also Robert’s crew that found an outer wall panel missing above a leaking window. The missing OSB panel was in the same room that needed other OSB work. Those OSB problems were pointed out to Jim Rutherford, then 8 x 10 photos were given to Beau and Jim Rutherford to repair those walls very early in the construction process. Thank you, RKL Construction at www.buildzoom.com/contractor/rkl-construction-llc. 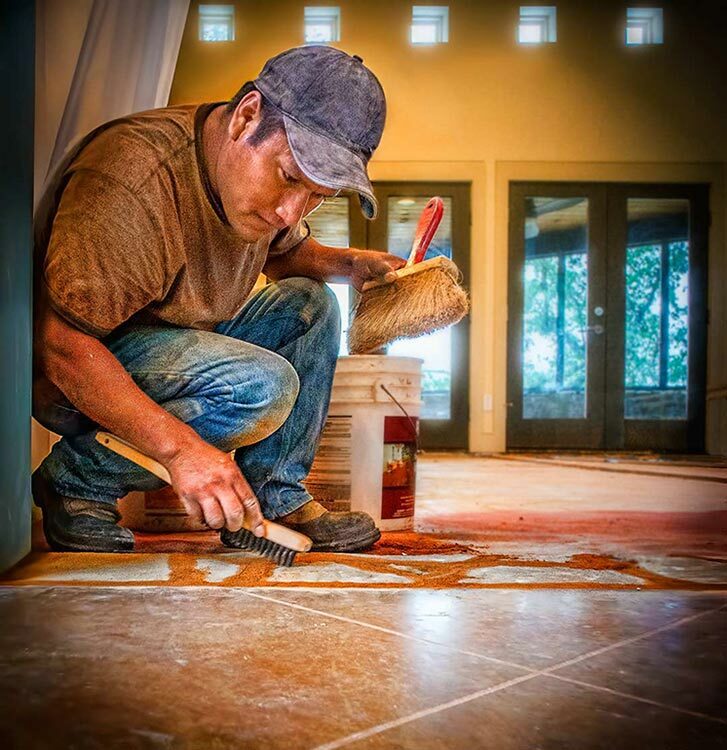 Cory Hanneman, owner of Texas Etch and Score, now “element 7 concrete flooring”, Marble Falls, wonderful precision artisan in scoring and staining our floors, did all but the final finish on our home. After we moved in, we contacted Cory about the horrible finish on our floors and asked why he didn’t do the final step. Although we paid Rutherford Custom Homes promptly, Cory said he was having trouble getting paid and challenged our builder on that, then was not brought back to finish the job. The other firm that was brought in to do the final work, applied an awful, thin coat that scratched and came up quickly. Cory has merged two firms and his company is now called “element7concrete flooring”. It is great to see someone with his strong work ethic and customer care, grow his business. Thank you Cory and Element 7 Concrete Flooring. Eric Eskelund, of Woodcreek, fashioned the beautiful and natural wood shelves for our large entry foyer and created the same for the iron and wood stair railing system, as well as other carpentry.